The Traveler… the first “learned society” of Washington, D.C. 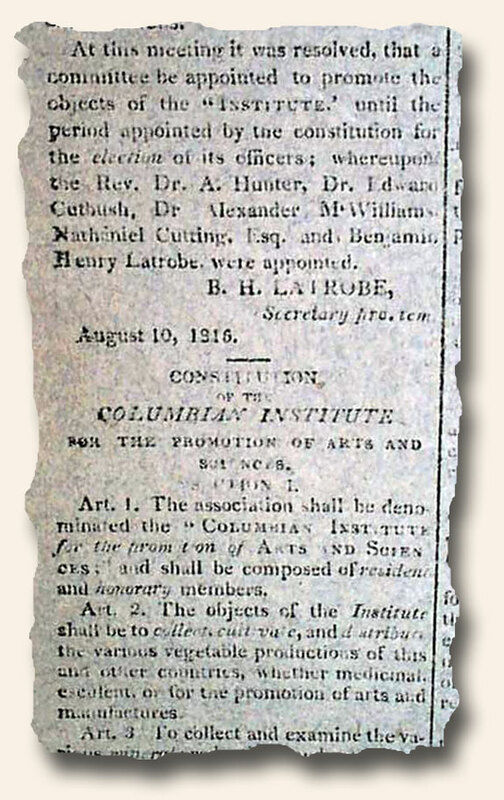 I traveled today to Washington, D.C. by the way of the National Intelligencer dated August 15, 1816. I found there the announcement of the creation of the first “learned society” in Washington D.C.: “A number of the citizens of the District of Columbia, impressed with the importance of forming an association for the purpose of promoting useful knowledge, met on the 28th day of June, 1816,… agreeably to public notice the committee appointed as aforesaid reported the following draft of a constitution which was unanimously agreed to, after having changed the name of the association to that of the COLUMBIAN INSTITUTION for the promotion of Arts and Sciences…” (see image below). They were responsible for the acquiring the many different species of plants and trees, an idea to apply to Congress for “the appropriation of about 200 acres of ground called “the Mall” which was designed in the original plan of the city for a public garden, the beginning of the botanic garden, many items which are now in the Smithsonian Institute, and more. Many prominent people of the day became were members, including some Presidents.